Can Coronado retain its small town charm in an era of ever-increasing density? 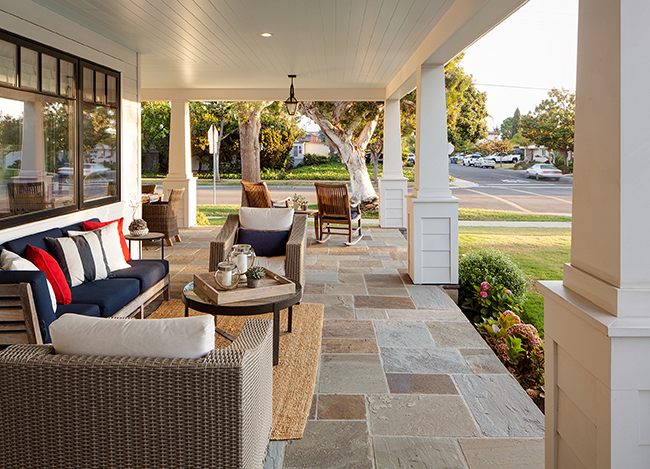 It’s a fine line that architects and builders walk in Coronado as they strive to produce homes that meet their clients’ wants and needs, while trying to maintain the sense of history and charm that symbolizes the city. And, as housing density grows, so do the number of cars vying for the finite amount of parking on city streets. 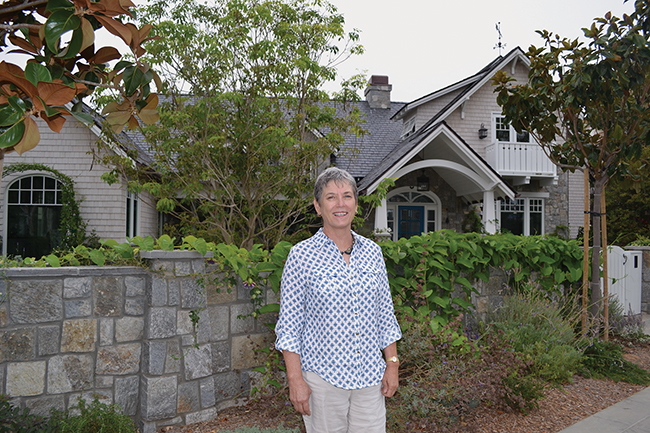 Leading the charge for updating the city’s zoning requirements is architect Dorothy Howard. Howard, who also serves on the city’s commercial design review committee, heads the RSIP3 (Residential Standards Improvement Program) committee. The city’s instructions to the committee, Howard said, were to “be more aggressive” in this third attempt in as many years to tighten zoning codes to restrict bulk and mass. The biggest concern is when a single home (or two) that comfortably spanned two lots totaling 50 by 140 feet, is razed and in its place four “cloud condos” are erected. Cloud condos are in essence structures that do not touch but occupy the same dirt and air space. Often, they are built with tandem parking garages that end up being used for storage, with tenants opting to park on the street. “That’s what these properties in the R3 zone are zoned for,” Howard said. She noted that the first zoning maps in Coronado took effect around 1973. Prior to that there was no zoning. Zoning started in various states and communities about a century ago, although some cities, including Houston, still have no zoning. “You can build anything anywhere there,” Howard said. economic groups an opportunity to live in a community. Another recommendation in the R3 zone, is that “where there are long skinny [tandem] garages, they will be required to have open stalls to encourage people to park there,” Howard said. Is Coronado’s small town charm alive and well or has the bloom begun to wither? “Our zoning ordinances encourage a sense of neighborhood, with FAR’s bonus system, such as incorporating a front porch, to gain a point or two in allowable square footage,” Rice noted. Architect Kevin Rugee said that despite the fact that many new houses are two stories, they can still fold well into a community’s fabric. He referred to two historical homes, both small and large that his company recently completed: one at Eighth and J streets received a Coronado GEM (going the extra mile) nomination from the Coronado Historical Association and the other at Alameda and J won the GEM award this year. Rugee believes that Coronado will always have a small town feel. “Coronado is an island and is its own city — and one of the best cities in the country the way it’s run. Howard likens the history of homebuilding in Coronado to peeling back the layers of a tree. Christian Rice said many of his clients like to mesh two styles — perhaps Cape Cod and contemporary or Spanish and contemporary — into a home design. Rice has also designed several contemporary condominium projects. One at the corner of Sixth and Orange (across from Spreckels Park) had zoning that would have allowed nine units. Instead, Rice’s client settled on four, with the “condos” joined only in the back taking on the appearance of contemporary single family homes, especially with individual siding and details. Rice is also designing a new home for his family of four, a two-story main house with a central courtyard of contemporary design. Rugee said that he asks clients to bring him photos from magazines, or the popular websites Houzz and Pinterest to see what they like and don’t like. “Part of being a good architect is being a good listener,” Rugee said. “It’s about considering the overall scope of the work and all the things a client wants and then honing that into the reality of what you can actually do. “You sometimes have to double up on the uses of rooms, which leads to the popularity of an open great room that unites a dining room, kitchen and family/living room. Or it might mean a ‘flex’ room that can be a study or office and double as a guest room. “You don’t want rooms to sit around and not be used,” Rugee advised. “That includes back and front patios. I will ask a client, ‘Do you do a lot of entertaining?’ The type of amenities that go into a back patio has to fit the proportion of the space. It might be a simple barbecue and place to sit and eat and enjoy a glass or wine. While architects often design large homes, they are delighted when they come across the opportunity to build or remodel smaller spaces. Rugee and his wife, Gail, recently moved to Coronado, remodeling a circa 1950s home they have owned for 20 years. The 1,200-square-foot house that Rugee describes as “our little cracker box” now features a Mid-Century Modern exterior, designed by Gail, an interior designer. It’s just the right size for the empty nesters and just a couple of blocks from Rugee’s office on Isabella. 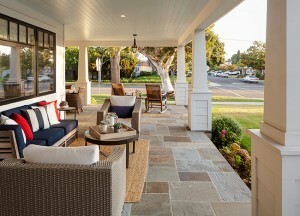 Large front porches such as this one designed by architect Christian Rice in the Country Club area contribute to Coronado’s friendly neighborhoods. Architect Dorothy Howard designed this Glorietta Boulevard home in a classic style that seamlessly blends with its surroundings. Christian Rice holds a model of his home now under construction at Seventh and Alameda. The contemporary home will feature a central courtyard. Kevin and Gail Rugee’s 1950s-era home now features a Mid-Century Modern exterior designed by Gail, an interior designer. 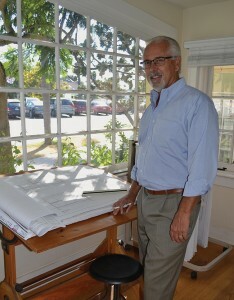 Architect Kevin Rugee at his Isabella Avenue office. A single-story Hawaiian Plantation-style home on Glorietta Boulevard designed by Kevin Rugee Architect used only a small portion of its allowable floor area ratio allowance. 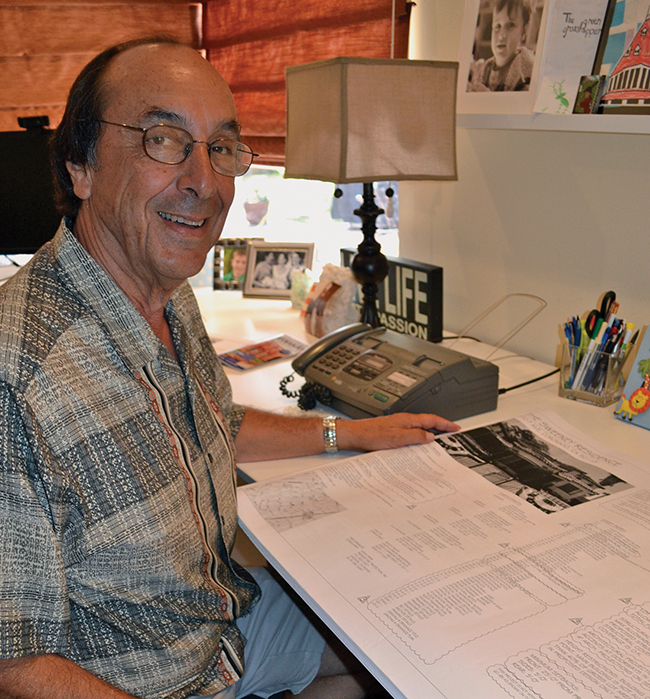 Joe Belmonte has an appreciation for Coronado’s historical homes that goes back to his years growing up on the island. He and his Coronado High School sweetheart, Sue, have been married for 44 years and live in a spacious Country Club home, an example of his firm’s design and build work. 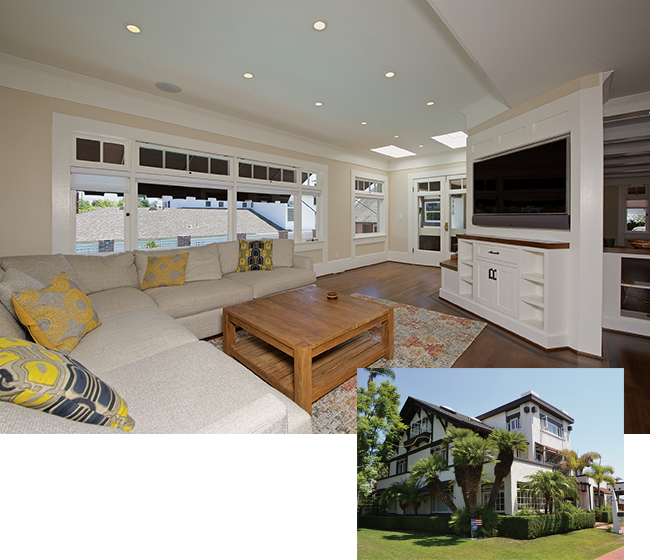 Most recently, Belmonte and his firm, Bartocci Development, headquartered at 2535 Kettner Ave. in San Diego, completed a remodel of one of Coronado’s most iconic homes, a three-story residence at 611 A Ave. built in 1908 by noted San Diego architect William Hebbard. And while a priority was to keep the home’s Tudor exterior as intact as possible, the interior renovation was a different story. The result is a big room with higher ceilings and the whole effect is bigger and brighter, he said. The redesign removed a fireplace in the dining room and enlarged the fireplace in the living room. “It required a lot of work to bring the fireplace out 10 inches and enlarge the fire pit, but it made a huge difference,” Belmonte said. Belmonte’s work extends to new construction as well. 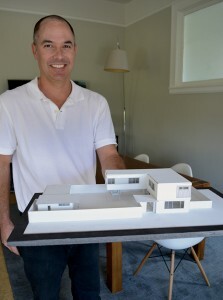 At the highest point on the island in the 300 block of F Avenue, he’s proudly finishing work on a home occupying one of Coronado’s most common lot configurations: 25 feet wide by 140 feet deep. “It’s an example of where you can live luxuriously and spaciously through design that is well-thought-out,” he said. The new four-bedroom, four-and-a-half bath home features coffered and box-beam ceilings, two fireplaces (one in the master suite) and stone and brick accents on the exterior. “The front patio and rear patio of the home will open with bi-fold doors and will visually enlarge the home,” Belmonte explained. It also includes a subterranean floor and rooftop deck with wet bar, which takes advantage of the 360-degree island and bay views. A carriage house over the alley garage embodies a mini-cottage feel with kitchenette, sleeping area, two dormer windows that create a great sitting area plus plenty of storage. An outdoor kitchen and see-through free-standing fireplace provides a space for socializing between the main house and the carriage house. Bartocci Development’s remodel brought a 108-year-old Coronado treasure into the 21st century which included upgrading electrical and lighting. The exterior of the three-story Tudor home remained intact. 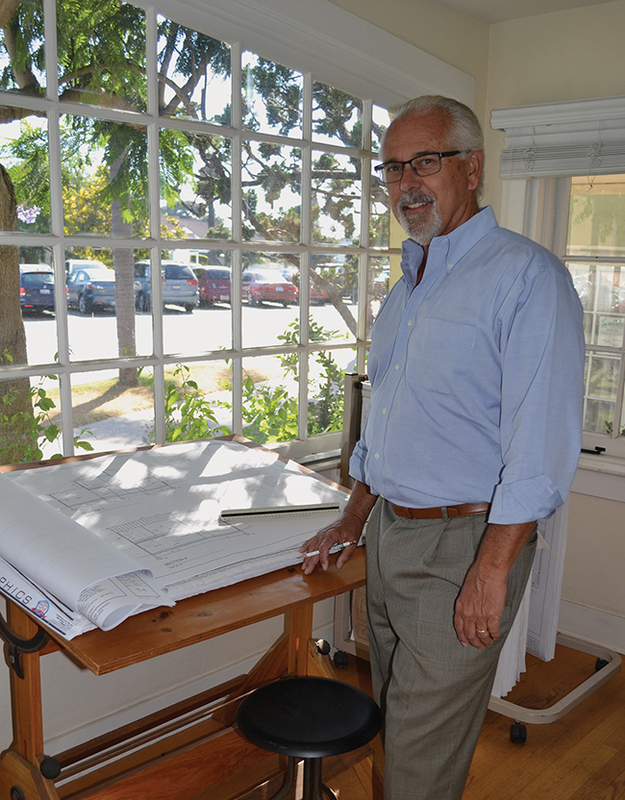 Joe Belmonte, principal at Bartocci Development, specializes in historical renovations. The Tudor home remodel transformed the third-story bathroom into a luxurious retreat with spa tub, skylights and spacious shower. Bruce Woodruff and his son Will Woodruff have roots that run deep in Coronado. Bruce served as president of the Coronado Chamber of Commerce (1999-2000) and Will is a graduate of Coronado High School, class of 2002, and also holds a bachelor of arts degree from UC San Diego in sociology. “I wanted to help make the world a better place,” he said of his choice of major, but he finds it applicable in relating and listening to his clients. Bruce, who began his career in construction in Virginia, obtained his general contractors license in 1983 and moved to California, continuing to work in various construction trades. Together, the father and son form the nucleus of Crown City Construction, with offices at 1224 Orange Ave., Suite 100. 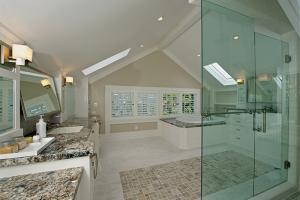 The firm specializes in everything from small to full-scale remodeling projects. 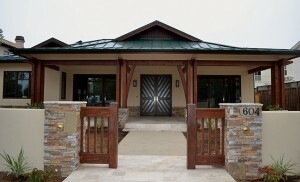 It will take on smaller projects, such as a room or patio additions, that larger firms sometimes shy away from. “We’ve found that clients we’ve done small projects for often return with larger assignments,” Bruce said. Such is the case with a home on Pomona Avenue where the team did a kitchen remodel and now is completing a master bedroom and bathroom. 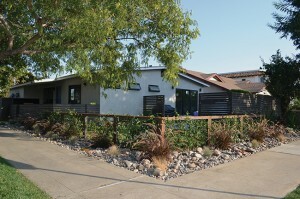 The firm has built a number of new Coronado homes, including a distinctive Mid-Century Modern home on Alameda, a two-story contemporary in the Country Club and another on Palm. Outside of Coronado, their work has included such diverse projects as a Spanish hacienda with 10-inch thick walls with inset windows in East County, a 16-unit apartment complex in Talmadge and a “tiny house” desert hideaway in Anza Borrego. 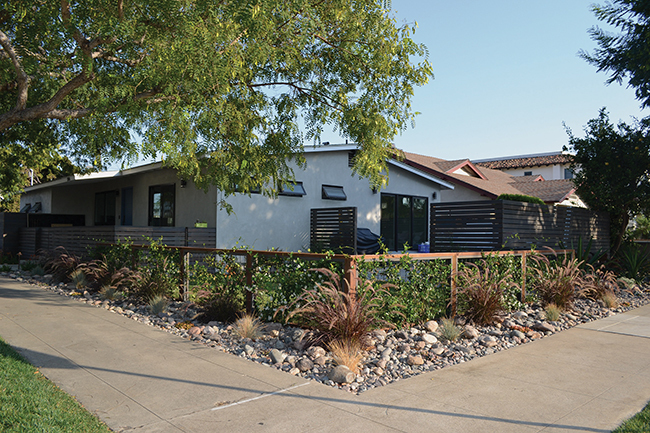 Crown City Construction also shows customers how they can maximize energy efficiency through insulation that adheres to California’s Title 24 energy codes.